I am deeply saddened today. Not for me, but for how some people let their country down so much. How they will childishly let a moments worth of bad thought, destroy the view of those who care about and love the Philippines. 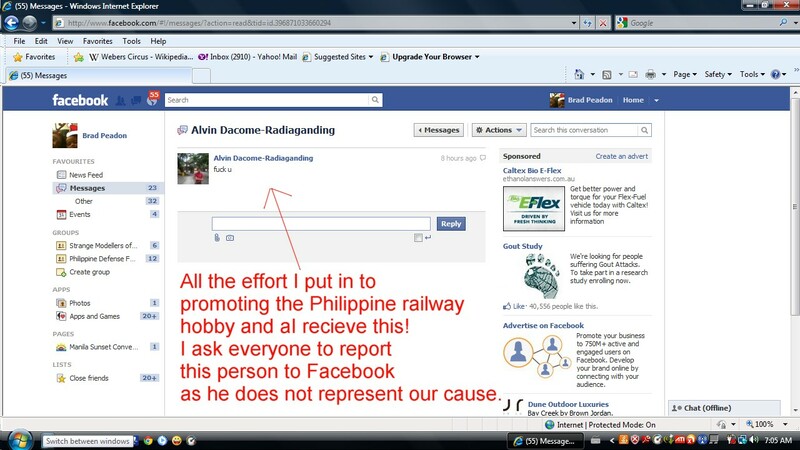 This morning I recieved this from Alvin Dacome-Radiaganding. I find that 13 years of promoting, pushing and building a railfan and preservation hobby in the Philippines has been brought to this single comment. To convey some sort of idea of my confusion over it all. I have never met this lad, never had much correspondence with him, but he has developed a great hatred solely based on my correcting him that the MRT vehicles are not 4th generation LRT ones. Despite my comments solely being to help, as they always are, I, and quite a few others, have recieved threats and hate mail regularly from this lad. I am now seeking legal recourse against him for the threats made to others and the verbal abuse aimed at me. For 13 years I have taken interest in the Philippines and its future more so than my own country - today I find a childish turd (apologises but I am disgusted) who would rather destroy all we have achieved. All that the likes of Brian, Michael, Karel, myself etc etc have achieved. 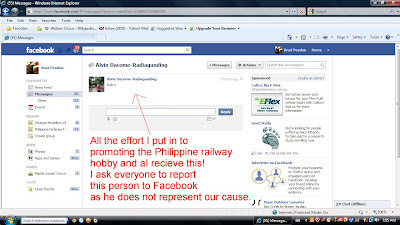 Lets make sure that people like Alvin Dacome-Radiaganding, who obviously dislikes their country, do not sway us from making this a great hobby. I'm blocking him from my FB and recommend all others who love the Philippines do the same. To steal a quote "The Philippine Is Worth Fighting For"
Just ignore it. His comment looks more like he just wants to have a bit of fun or katuwaan (his view of fun, of course) and see how you will react. The best way to disappoint him is to ignore him. He won't know if you've read his post or not if no one reacts. The more noise he makes, the more he will look silly. Cheers. And keep up the good work. Just ignore that man, There is hope in every positive things we want to happen, specially if you want this not just for yourself but for everyone.